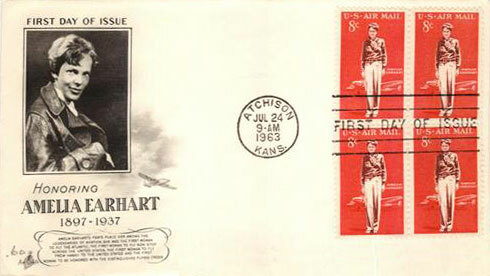 US #C68 was issued on Earhart’s 66th birthday. Click the image to buy. On January 11, 1935, Amelia Earhart became the first person to fly solo from Hawaii to California. 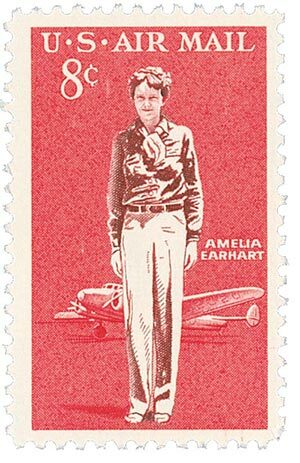 Born in 1897, Amelia Earhart had a love of adventure from a young age. She became fascinated with flight after riding a roller coaster as a child and first rode in a plane in 1920. Of that event when she was 23, Earhart stated, “As soon as I left the ground, I knew I myself had to fly.” She immediately took flying lessons, earned her pilot’s license, and bought her own plane. Earhart earned national attention in 1928 when she rode as a passenger on a transatlantic flight. But she wanted to earn recognition for her own flying talents, and in the process, help to further the cause of female pilots. 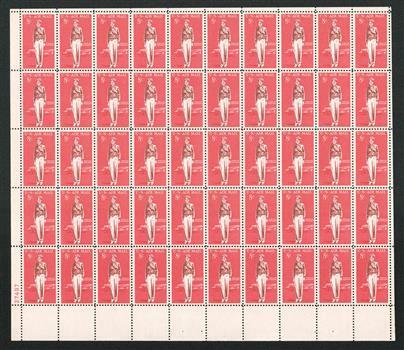 US #68 – Mint sheet of 50 Earhart stamps. Click the image to buy. Four years later, Earhart achieved her goal, becoming the first woman (and the just the second person after Charles Lindbergh) to fly solo across the Atlantic Ocean. She also made the flight in less than half the time it had taken Lindbergh. And later in 1932, she set the record for a female-piloted flight across the United States. US #C68 – Classic First Day Cover. Click the image to buy. After that, Earhart set her sights on a new goal – flying alone from Hawaii to California. A business in Hawaii was offering a $10,000 award to the pilot that could complete the flight first. That flight was 400 miles longer than the transatlantic trip and more dangerous. In December 1934 a pilot attempted the journey and disappeared into the ocean. Item #M11006 was issued for the 75th anniversary of Earhart’s disappearance. Click the image to buy. But Earhart was determined to achieve her goal so she took extra precautions. She removed the passenger seat from her plane and installed extra fuel tanks there. She also set up an advanced two-way radio system to keep in contact with radio operators on the ground. 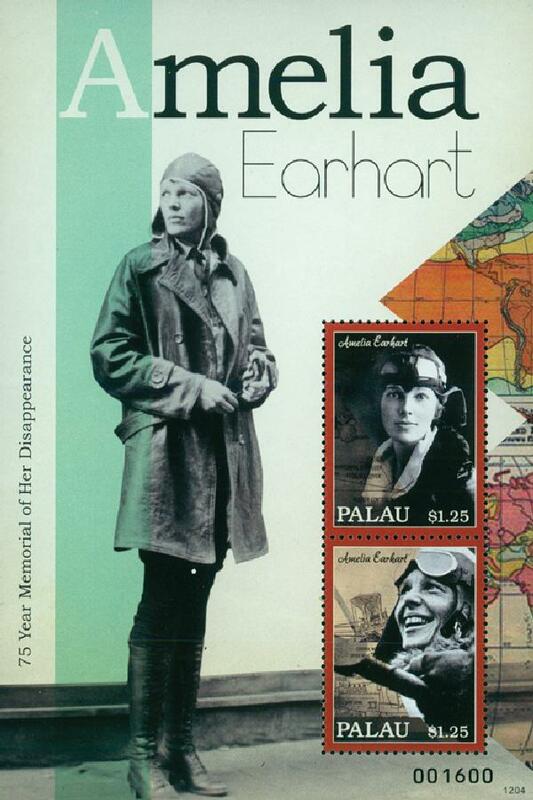 Item #M11007 was also issued for the 75th anniversary of Earhart’s disappearance. Click the image to buy. On January 11, 1935, Earhart departed Wheeler Field on Oahu, Hawaii despite a light drizzle. She flew through the night and listened to a symphony broadcast over the radio for part of the trip. 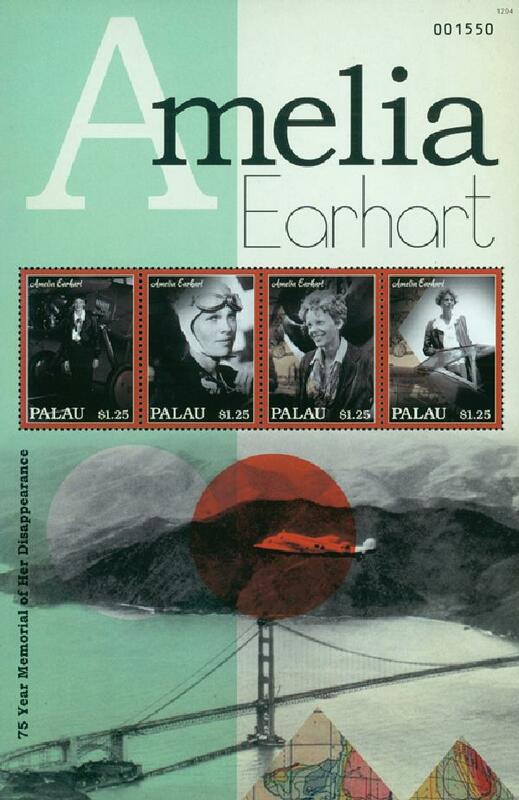 After 18 hours and 2,400 miles, Earhart landed in Oakland, California the next day. There, thousands of spectators excitedly watched her approach and flooded the runway to congratulate her. She was the first person to successfully complete the trip from Hawaii to California alone. Shortly after, First Lady Eleanor Roosevelt invited Earhart to visit the White House. Click here to read Earhart’s account of the flight. 4 Responses to "This Day in History… January 11, 1935"
And a very remarkable lady. And a truly remarkable plane. Wow. I knew of some of her exploits but this is new to me. Thank you Mystic for the education.